The circular saw is one of the most versatile cutting tools which you can have in your kit. Also known as skill saw, you can use it for making different types of cuts including miter cuts as well as angle cuts. 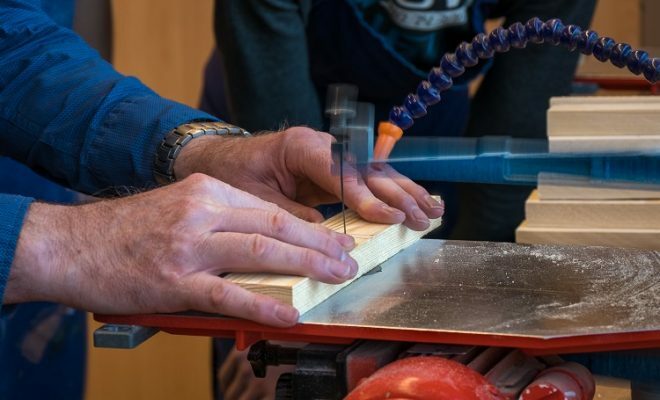 Apart from using a circular saw for wood-cutting tasks, it also comes in handy for a series of non-wood projects such as plastic, masonry or even metal. When it is such a powerful cutting tool, it is also extremely lightweight so you can easily carry it from one place to the other on your jobsite. However, when it is such a proficient cutting tool, which makes it a must-have in almost every handyman’s toolkit, it also gets depicted in the asking price of these models. In addition, depending on your personal preference, as if whether you’re a hobbyist woodworker – who is going to use this tool for the sake of fun – or a professional customer, you’ve to be critical of the size of the blade, the device’s RPM along with various other features. So, if you’re looking for the best circular saw 2019 that will help you realize your DIY projects, we have prepared circular saw reviews and TOP-10 comparison table. Coming from a trusted manufacturer, the DEWALT DCS391B is designed for all those of you who are serious about their woodworking projects. Incorporating a powerful motor, this battery powered circular saw features an impressive speed of 5150 RPM which helps you to make tough cuts without any hindrance. The DEWALT DCS391B comes with a 6 ½’’ carbide blade which has no less than 16 teeth. When this blade can cut up to 1 – 5/8’’ (depth) at 45 degrees, it can go up to 2 ¼’’ in depth while making cuts at the angle of 90 degrees. This blade has a bevel capacity of 0-50 degrees which makes it a versatile unit, especially for angled cutting. Furthermore, if you’re going to use this saw for a consistent duration of time, it comes included with a high-quality arbor which makes it quite easy to replace the blade. This blade is mounted on the left-hand side of the motor which gives a clear sight of view, especially to the right-handed woodworkers. The DEWALT circular saw has an efficient stop brake which comes into play as soon as you leave the trigger. It is a nice little addition which not only enhances the accuracy of this unit but at the same, it also allows you to operate this saw without any kind of danger. There is no circular saw on the market which can be used for a lifetime. But when Dewalt is a trusted manufacturer, it makes sure that you can use the DEWALT DCS391B for at least 3 years. So on making this purchase, you’ll get a 3-year warranty which is a further proof of the quality of this purchase. One thing which you’ve to keep in mind while making this purchase is that you’ve to purchase the batteries & charger separately along with the DEWALT DCS391B. The manufacturer isn’t offering them with this unit which might be a drawback for some customers. 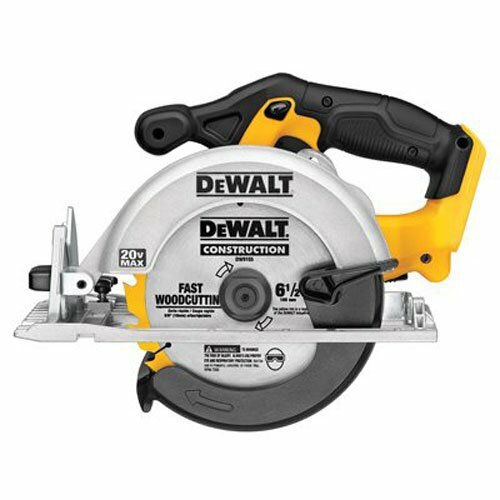 If you’re looking for a best cordless circular saw from a trusted manufacturer, the DEWALT DCS391B can be your ideal purchase. This product comes with a powerful motor which makes it easy to handle a wide range of cutting tasks for the owner of this unit. Rockwell RK3440K is a lightweight circular saw that is pretty easy to operate as well. Weighing 4lbs, it further comes with a sleek design which means that you can use it even with one hand. Despite such a lightweight construction, this product still comes with a handful of features which ensures that you can use it for cutting wood, plastics, and tiles along with a handful of other materials. The Rockwell RK3440K comes equipped with a laser indicator which makes it quite easy to align your cuts in an imperious manner. As compared to a majority of other such products in this category, this one makes it easy to produce precise cuts even for the newbies. However, if you’re looking to operate this unit without the laser guidance, the manufacturer has designed a laser on/off switch along with this portable circular saw. The Rockwell RK3440K features a 4 AMP powerful motor which makes it a versatile unit for professionals as well as Do-It-Yourselfers alike. Such a powerful motor allows the 3.8’’ blade of this unit to go through a wide range of materials without any restriction. For the user’s convenience, Rockwell has provided a depth-adjustment lever on one side of this equipment so you can control the blade’s cutting depth with a certain ease. Starting from 0’’, it can be adjusted up to a bit more than 1’’ and once you’ve selected the desired depth, this level will lock itself into place which means that you won’t experience irregular cuts while using this saw. For the owner’s safety, the Rockwell RK3440K combines a sturdy lock-off switch along with a couple of full metal guards. When the former mechanism averts accidental starting, the latter enhances the lifespan of the carbide blade. 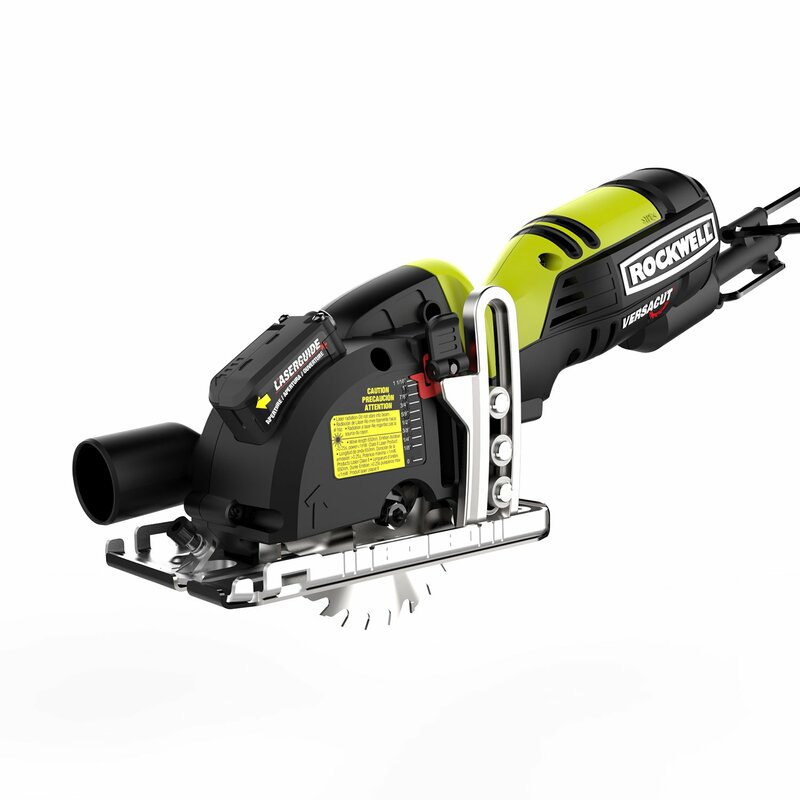 The Rockwell RK3440K is covered by a 2-year warranty which, when combined with the inexpensive price tag of this saw, makes it an ideal product for the budget-oriented customers. The Rockwell RK3440K is ideal for all those woodworkers who’re looking to make this purchase without straining their bank balance. Available at an affordable price, this circular saw still comes with a series of hi-tech features – such as the laser guidance along with an extraction adapter– so you can use it for a variety of cutting projects. 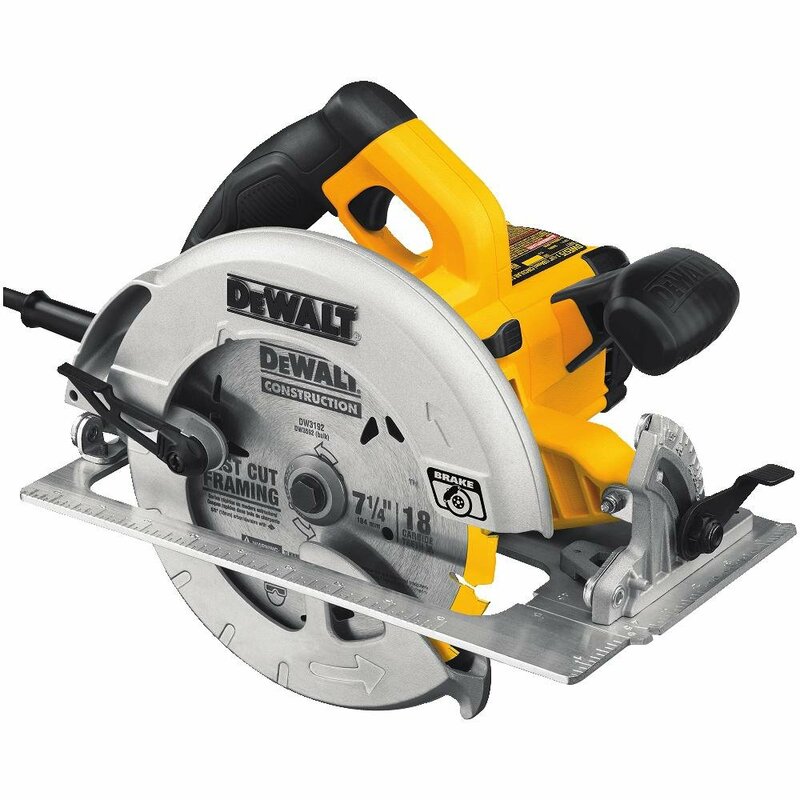 The DEWALT DWE575SB is one of the best corded electric circular saws which you can purchase from today’s market. Featuring a 7 ¼’’ blade, this product boasts a useful fusion of capacity, durability, and ease of use. The overall weight of this equipment is just under 9lbs and even with such a lightweight construction, this compact circular saw has still a lot to offer to a wide range of woodworkers. Incorporating compact dimensions, the DEWALT DWE575SB is still capable of rotating the blade at an impressive speed of 5200 RPM. It consists of a carbide tipped blade which is made up of 100% gluten-free steel. Apart from using this saw for heavy-duty applications, you can also use it for an extended duration and this product won’t stall on you. When it comes to almost any circular saw, one problem which is commonly associated with this equipment is the accumulation of sawdust. Apart from filling your workshop with a lot of dust, this sawdust also hinders your line of sight while dealing with this machine. However, there is no such issue with the DEWALT DWE575SB thanks to its powerful dust blower system. It blows away the dust and debris so you can finish your work in a clean environment. Moreover, it gets turned on automatically as soon as you start this equipment so you can be fully sure of where the blade is coming in contact with the underneath material. The DEWALT DWE575SB comes with an increased cutting capacity as you can use its versatile 7 ¼’’ blade for making bevel cuts up to the range of 57 degrees. It comes with two bevel stops which are provided at common angles (22.5 degrees, 45 degrees) so you can finish your job without wasting any time. Moreover, the small circular saw can go up to 2.55 inches deep while making cuts at 90 degrees and when it comes to making cuts at 45 degrees, it comes with a maximum depth of 1.9 inches. For optimum safety, the DEWALT DWE575SB comes included with an electric brake which engages as soon as you lift the saw up after producing your desired cut. This is an excellent safety measure which is hard to find when it comes to other mini circular saws. The DEWALT DWE575SB is a compact circular saw which can be used for an extended duration without any sort of fatigue. Incorporating a lightweight construction, this product is covered by a 3-year warranty so you don’t have anything to worry about the quality of this acquisition. If you’re looking for a high-quality circular saw which is specially designed for Do-It-Yourselfers, have a look at the SKIL 5680-02. When such kind of customers demands a user-friendly equipment, which should be devoid of any sort of complex mechanism, this product has it all in an imperious manner. 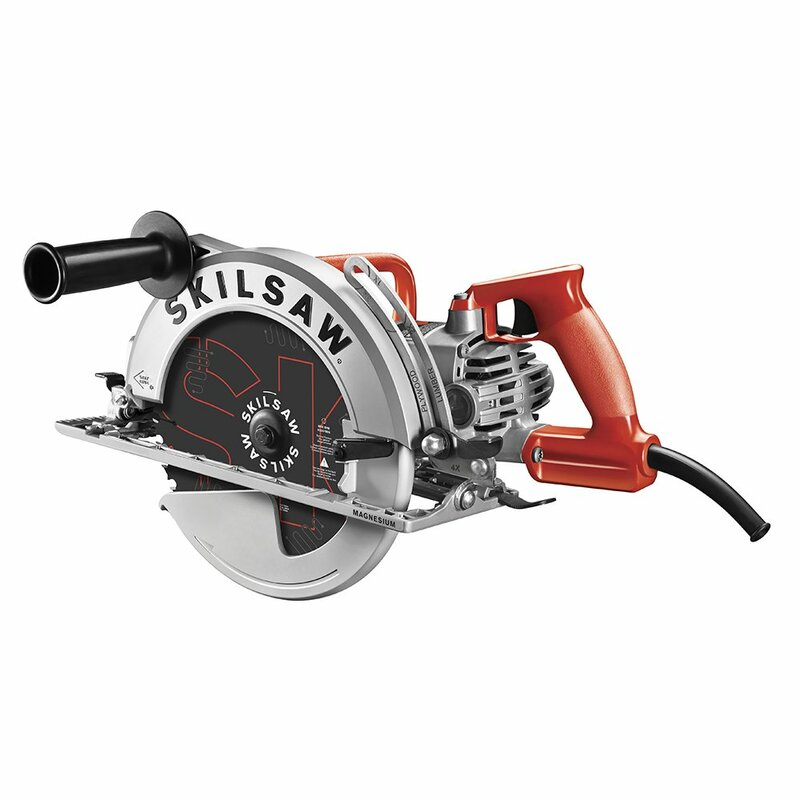 The SKIL circular saw features a decent bevel range of 51 degrees which is more than enough for almost any residential project. The manufacturer has further provided a positive stop 45 degrees which is the most commonly used angle amongst a wide range of DIYs. Apart from completing your job in a timely manner, such sort of construction also helps you to achieve precise cuts. Furthermore, this saw possesses a decent cutting capacity as you can use its 7 ¼’’ blade for making perpendicular cuts up to 2-7/16’’. When it comes to making cuts at 45 degrees, it can go up to 1-15/16’’ in depth while producing flawless results. The SKIL 5680-02 makes use of an accurate laser line guide which can be activated with the help of the laser button. The laser guidance is particularly useful for the beginner woodworkers as it allows them to make accurate cuts without any hassle. If you’re a professional woodworker, who wants to complete his job in a timely manner, you might be annoyed with the presence of a safety switch in this equipment. However, when it comes to DIYs, who always want extra assurance in terms of safety, this safety switch is highly beneficial. When it prevents this circular saw from accidental starting, you don’t have to worry about your own safety while working with this unit. Another feature which is designed while keeping in mind the safety of its owner, the SKIL 5680-02 incorporates a power light which remains turned on as long as this saw is operational. It saves you from unwanted surprises in case you forgot to turn off this device at the end of the day. So even though this saw is devoid of an electric brake, it still comes with a handful of safety measures. 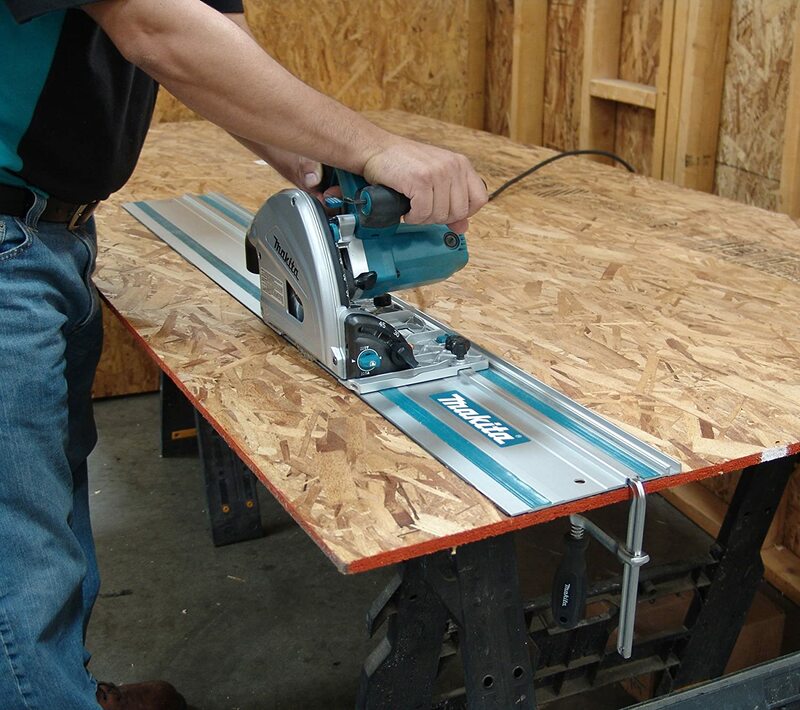 If you’re a part-time woodworker or one who wants to make this purchase to complete some sort of residential projects, there aren’t much better products available in the market than the SKIL 5680-02. Apart from its wide-range of features, this circular saw comes with an affordable price tag which bodes well with a vast majority of customers. If you’re a professional woodworker, who is looking for a circular saw which can be used for heavy-duty applications than look no further. Featuring a worn drive engine, the SKILSAW SPT77WML-01 combines durability with precision. Made of lightweight yet long lasting magnesium, this product can be used to perform even the toughest of cutting tasks and it will still come out without any kind of damage. One thing which differentiates an ordinary circular saw from the worm drive saw is the quality of its motor. As per the SKILSAW SPT77WML-01, it comes integrated with a powerful 15AMPS motor which allows the blade to run at a no-load speed of 5300 RPM. In addition, this dual field motor keeps this saw from getting heat-up so you can use it for longer durations. This particular feature is ideal for all those of you who don’t want to waste much time while adjusting the cutting depth of this unit. Incorporating a depth bracket gauge, you can choose your desired setting in an instant which saves a valuable amount of time in the longer run. The SKILSAW SPT77WML-01 comes equipped with a sharp, 7 ¼’’ carbide blade which does a great job of going through thicker materials. You don’t have to exert much effort with this blade and when it retains its sharpness for an extended period, it means you don’t have to spend additional money for replacing this blade. As compared to a vast majority of worm drive circular saw, which is content with a bevel range of 51 degrees, the SKILSAW SPT77WML-01 goes one step ahead with a 53-degree bevel range with two positive stops at 0 and 45 degrees. 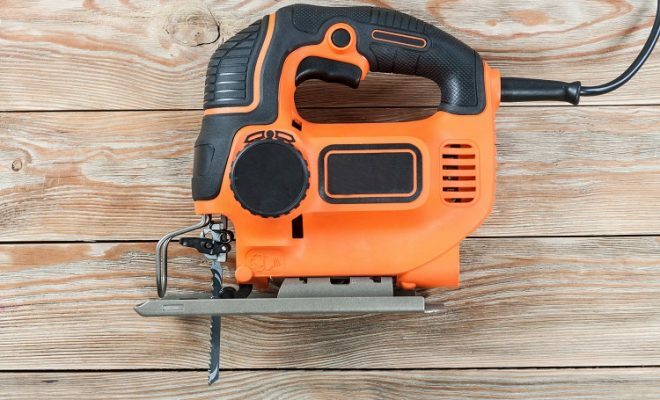 When it makes this device ideal for a wide range of cutting tasks, including decking, ceilings as well as siding, you can also use it on hard, soft or even engineered types of woods. 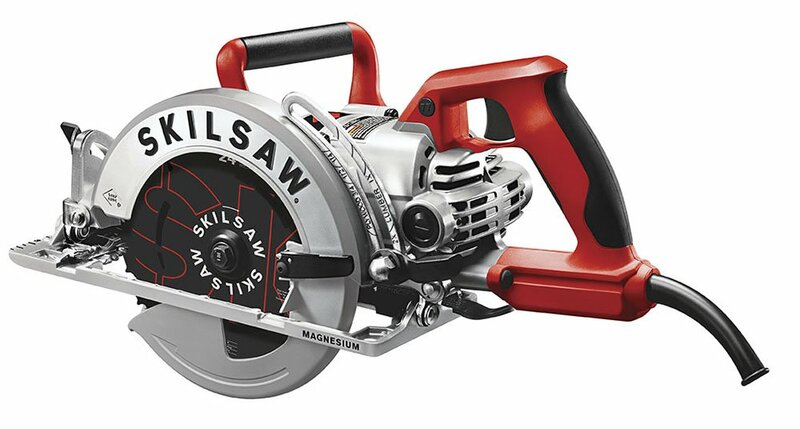 For us, the SKILSAW SPT77WML-01 is the best circular saw 2019. It is designed for all those customers who’re going to use this equipment on a frequent basis. Incorporating a sturdy construction, this product can handle tough jobs in an imperious manner. Even though it is a bit pricier, its price tag is completely justified once you look at the performance of this unit. 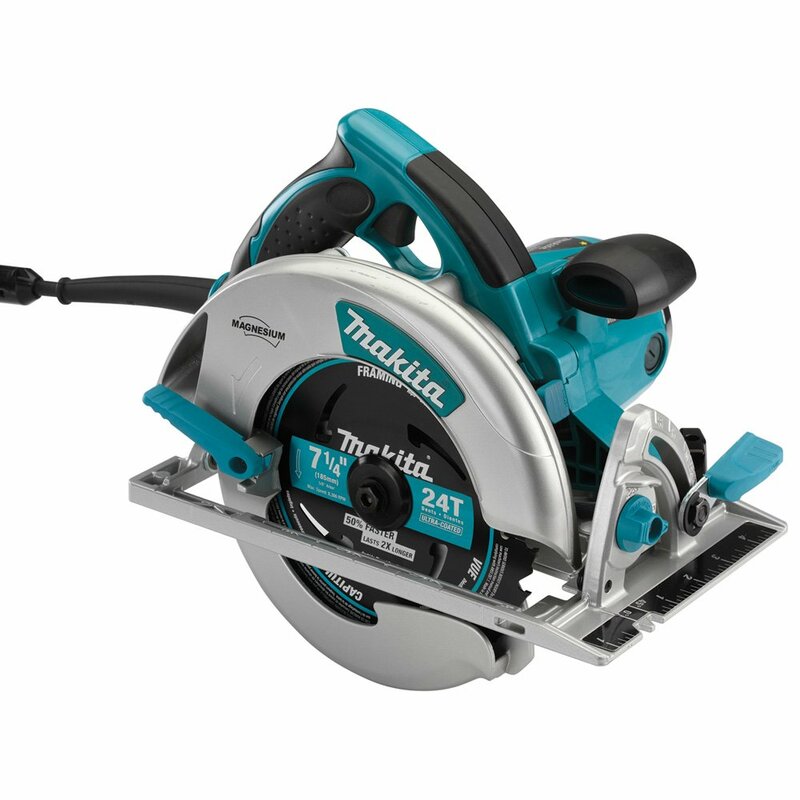 The Makita 5007MGA is a top rated circular saw which comes integrated with a powerful 15AMP motor. This product is designed to run at a speed of 5800 RPM which allows it to cut efficiently through a vast majority of materials. Also present in this equipment is an electric brake which allows you to move from one cut to the other pretty quickly. The Makita 5007MGA incorporates a 56-degrees bevel-cut capacity as the manufacturer has integrated two positive stops within this range. One of these dents is provided at 22.5 degrees and the other one is designed at 45 degrees. This tool comes with an increased cutting capacity as when you can use its to make cuts up to 2 ½’’ at 90 degrees, it can go up to 1 ¾’’ while making cuts at 45 degrees. Combine it with this decent beveling capacity and you can use this equipment for a wide range of cutting tasks. Weighing in at 10.6lbs, this is not the lightest circular saw in the market. However, this product is still pretty easy to maneuver, even, on one hand, thanks to its rubberized handle. When it helps you to attain optimum control over the saw’s movement, it eventually results in precise cuts at the end of the day. Another thing which I found quite impressive in the Makita 5007MGA’s design is its oversized markings. When these markings are easy to read, it allows you to adjust the depth as well as the bevel range on the go. For making sure that the user of this saw will always enjoy a clear sight of view, the Makita 5007MGA comes included with a couple of LED Lights. These lights do well to illuminate your cut line so you can cut very efficiently even in the absence of laser guidance. The Makita 5007MGA comes with a 7-1/4’’ blade which is a pretty standard size when you compare it with other circular saws. Then comes the 5/8’’ arbor blade which, when combined with the blade wrench which comes included in this purchase, makes it easy to replace the blade. Designed for roofers, framers, and carpenters, the Makita 5007MGA comes equipped with a wide range of features which makes it an ideal circular saw for a wide range of woodworkers. Featuring an increased cutting capacity, this product allows you to cut pretty quickly thanks to its blade speed of 5800 RPM. The Makita SP6000J1 circular saw is designed for all those woodworkers who’re looking to make precise cuts on a consistent basis. Incorporating a 12AMP motor, this product makes use of a 55’ guide rail which ensures that you’ll get the best possible cuts without extra hassle. When it comes to professionals, they have to deal with a large number of materials on their job site. When some of these materials require extremely fast blade, such as thick plastic sheets, there are others which can be cut with a relatively slow speed. In order to deliver optimal performance for all such materials, the Makita SP6000J1 incorporates a variable speed control. With its help, you can adjust the RPM of this unit from 2000 to 5200 which makes this product one of the most versatile circular saws in today’s market. In addition, it also protects the motor from burnout so you can use this product for years to come. The Makita SP6000J1 consists of a -1 to 48-degree bevel capacity with a couple of positive stops at 22.5 and 45 degrees. The bevel guide is provided at the front and the back end of this unit which makes it convenient to adjust the bevel angle as per your preference. Coming towards its cutting capacity, the 6.5’’ blade can cut up to 1–9/16’’ at 45 degrees with a further 2—3/16’’ at 90 degrees. Just like the bevel guide, a convenient depth scale is designed at the motor’s front which is ideal for all those of you who’re going to use this equipment on materials of different thicknesses. For avoiding any kind of mishaps, the Makita SP6000J1 uses an electric brake which is an excellent safety measure especially if you’re relatively new to the field of circular saws. The Makita SP6000J1 comes included with a 6.5’’ blade along with a hex blade wrench which makes it easy to replace the blade. Just like a series of other circular saws, there is an onboard storage for the wrench so you can carry it anywhere, along with the whole equipment. Equipped with a convenient guide rail, the Makita SP6000J1 does well to ensure smooth cuts on a consistent basis. So even if you want the best corded circular saw, one which can handle a wide range of materials, the product from MAKITA is worth a try. 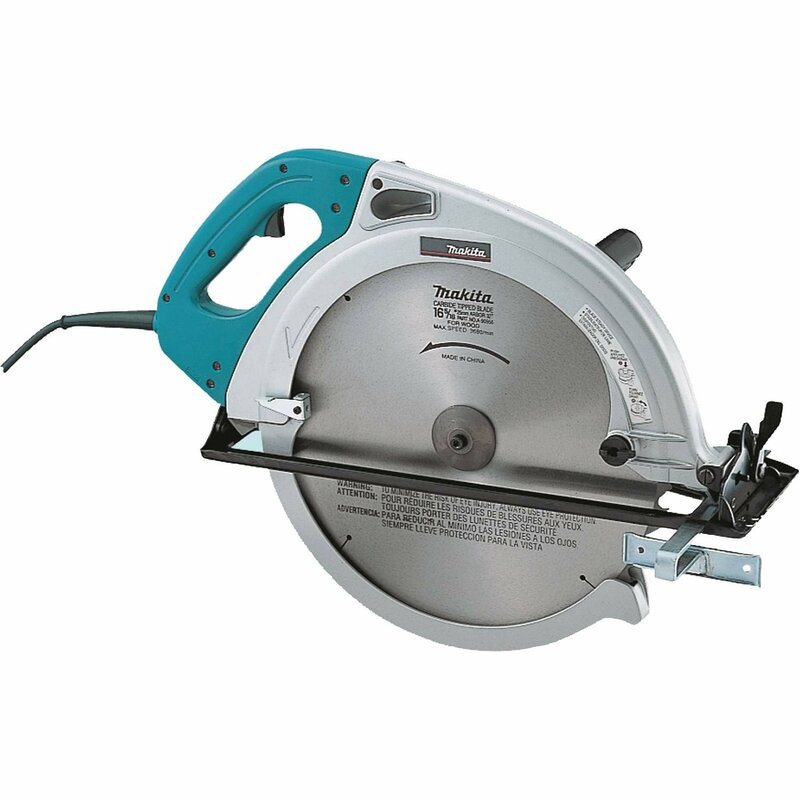 The Makita 5402NA is a powerful electric circular saw which is designed to cut almost everything which you throw at it. Featuring a mammoth 16-5/16’’ blade, this equipment runs on a powerful 15AMP motor which allows it to rotate at 2200 RPM. And when it comes to Makita, it is backed by the brand’s famous 1-year warranty along with a 30 days satisfaction guarantee. As compared to other circular saws, this 16-inch circular saw comes with a much-improved cutting capacity. The strong blade allows it to cut at different angles, up to 6 ¼’’ at 90 degrees & 4-3/16’’ at 45 degrees, so you can even cut beams and post with this circular saw. As per its bevel cutting range, it starts from 0 degrees and goes all the way up to 45 degrees. The Makita 5402NA uses a depth control lever which comes handy for convenient depth adjustments. Especially if you’ve to work for longer shifts, such kind of mechanism allows you to finish your job in a timely manner. One thing which I found quite impressive about this unit is the way it operates. At a time when the majority of other power tools tends to produce a great bit of noise while working, there is no such thing with the Makita 5402NA. This device comes with a noise level of 87dB which is certainly tolerable for a vast majority of woodworkers. Despite the fact that this isn’t the lightest machine, as the overall weight of the Makita 5402NA is just under 29lbs, the large handle – which comes integrated into this device – makes it easy to operate on a consistent basis. 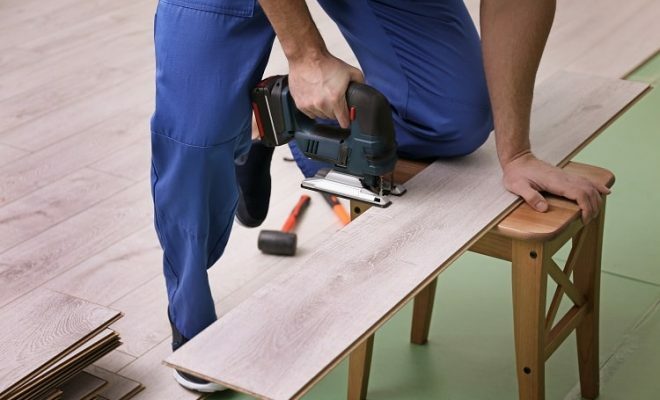 Apart from allowing optimum control over the saw’s movement, it makes sure that you don’t have to suffer from unwanted fatigue at the end of the day. If you’re looking for a circular saw which can cut beams and posts, big woods and pressure treated lumbers, the Makita 5402NA can be your ideal purchase. Having a powerful 16-inch blade, which is backed by a powerful motor, this product can even cut 6×6 materials with little hesitation. The Bosch CSW41 is a worm drive circular saw designed for carpenters and all other professional woodworkers who’re serious about their profession. Incorporating a durable construction, this saw makes use of a 24T carbide blade which allows it to cut almost any kind of wood. In fact, you can use this saw to cut up to 2-3/8’’ in depth at a perpendicular position and it can also be used to make cuts up to 1-15/16’’ at the angle of 45 degrees. The Bosch CSW41 circular saw makes use of a 15AMP motor which allows the 7 ¼’’ blade to run at a no-load speed of 5300 RPM. With such a powerful constriction, this saw can cut through 2x stacks of lumber without even breaking a sweat. 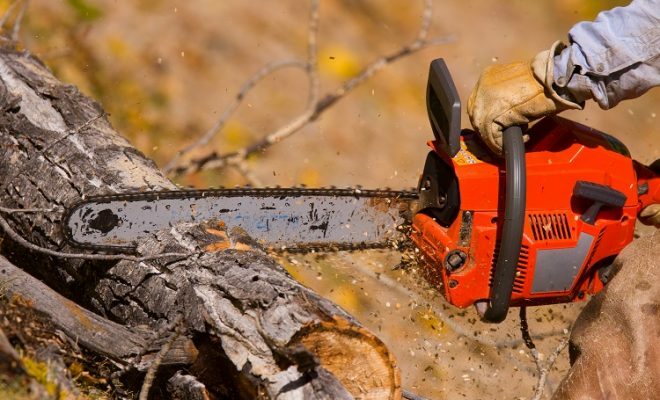 If you’ve just used some sort of worm drive circular saws in the past, you might be aware of the fact that most of these units are pretty heavier in weight. However, when it comes to the Bosch CSW41, it is no more than 13.2 lbs. in weight. Such a lightweight construction makes it one of the lightest saws in its category which is highly beneficial for you if you’ve to use this equipment for a good few hours every day. The Bosch CSW41 comes with an onboard wrench so you don’t have to purchase additional accessories after making this acquisition. When this universal wrench is compatible with all the screws of this unit, it can be used for changing as well as adjustment of the blade. 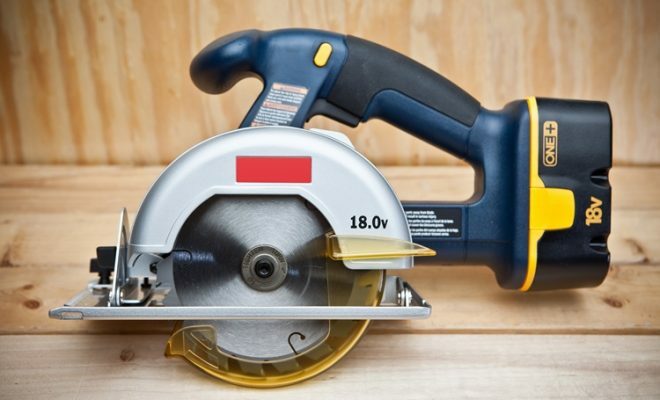 Starting from 0 degrees, you can make bevel cuts up to 53 degrees with the help of this 16-inch circular saw. For the sake of convenience, the bevel gauge is equipped with visible black markings which makes it easy to choose a bevel angle of your desired choice. Lastly, you can use any worm drive oil for lubricating this machine which can also be made from other manufacturers apart from Bosch. 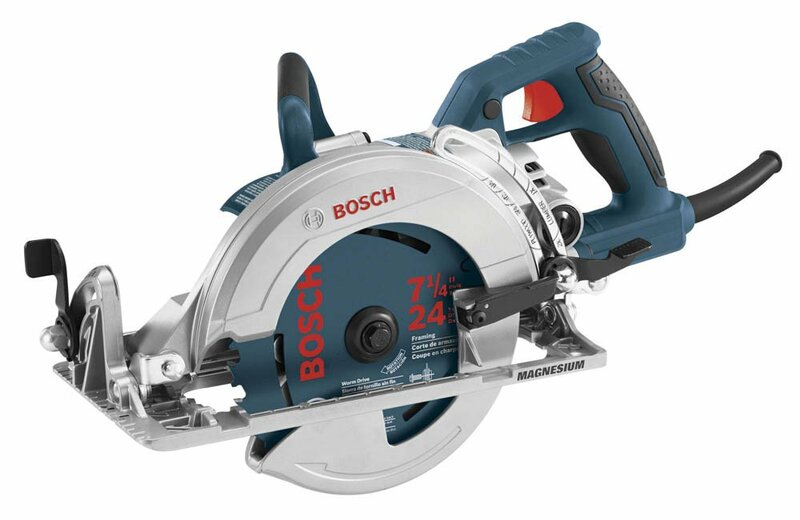 If you’re looking for a lightweight worm drive circular saw, one which comes from a premium manufacturer as well, the Bosch CSW41 can be your ideal choice. Featuring a standard sized blade, which can be used on different types of wood, this product is designed to last for a consistent duration of time. Last but definitely not least productive in this list, the SKILSAW SPT70WM-01 is viable for all those of you who’re looking for a staggering cutting capacity in a handheld circular saw. Incorporating magnesium construction, which comes handy for keeping the weight in check, this unit makes use of a 10 ¼’’ blade which can cut 4x material in a single try. So if you’re looking for a portable circular saw which can make even the miter cuts, this is the best budget circular saw available in the market. The 10-inch circular saw, which comes with a 40 teeth design, can cut up to 3-11/16’’ when held in a perpendicular position and when it comes to cut at an angle of 45 degrees, it performs extremely well up to the depth limit of 2 ¾’’. Even though it is a circular saw, you can expect it to make a wide range of miter cuts as well. Just like a majority of other such products from this particular manufacturer, the SKILSAW SPT70WM-01 makes use of a dual field technology. As evident from its name, it makes use of a dual copper winding which dissipates heat and keeps the motor cooler on a longer run. So even after using this device for several hours, it won’t get burnout. This 15 AMP motor is designed specifically to cut 4x materials in a single pass so regardless of the thickness of the material, you can complete your job in a very short span of time. This left-handed circular saw comes with a 180 days satisfaction guarantee along with a full 1-year limited warranty. So even if anything goes bad after making this purchase, you’ll still have enough time for replacing this saw. However, this is highly unlikely if you look at the exquisite feature set of this one of the best circular saws 2019. 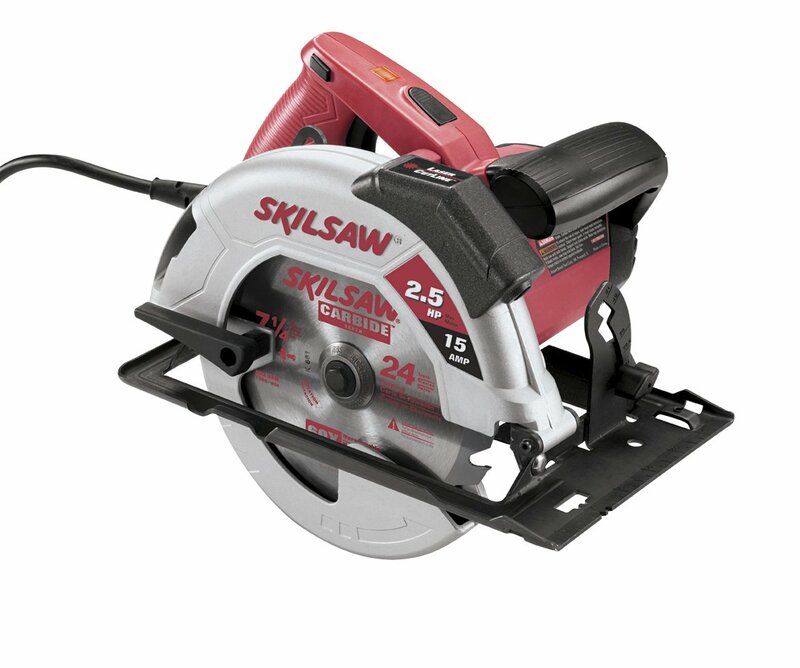 The SKILSAW SPT70WM-01 is ideal for all those woodworkers who really want to cut 4x material via a handheld circular saw. This is basically a heavy-duty tool which combines increased cutting capacity and a long-lasting construction. 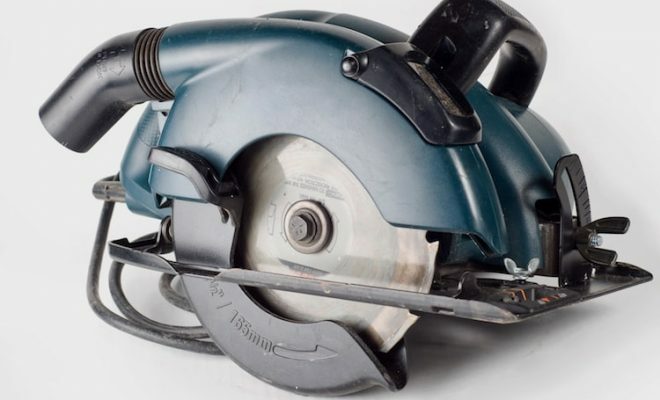 When it comes to operating the circular saw, whether it is a metal cutting circular saw or the cordless circular saw, a cheap circular saw or even the most expensive saw, it is imperative that one should observe certain safety measures before using this device. It includes wearing gloves, safety glasses and having proper clothing.